No one can deny the importance of making first impression. In this process, the role of physical appearance is highly influential. We usually spend good amount of time reading reviews regarding which movie is good, which shop gives best discounts, which latest mobile has advanced features etc. But when it comes to our own grooming up, we generally pay little attention to do research. If we pay some quality time in grooming ourselves, it helps us grow fast in our careers. We are going to discuss most important things a man should consider while grooming for any formal occasions. These are suits, blazers, shirts, ties, socks, shoes. Lets us discuss each item in details. In most of the formal meetings, widely seen attire for men is Business suits. Business suites are of two types. Single breasted and double breasted. 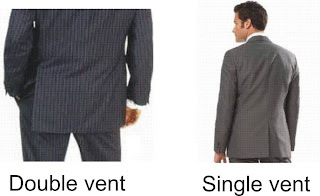 Single breasted type suits have a single column of buttons. These suits look good on almost all kinds of personalities. The bottom button of a single-breasted jacket is always left undone. The common colors you should choose from are charcoal Grey, Navy blue and Black. Double breasted suits may have two or more rows of buttons. These suits fit best the people who are tall. A double-breasted jacket should never be left unbuttoned when standing; it is always securely buttoned upon standing and remains buttoned until one is again seated. It is acceptable for both of the operable buttons on a double-breasted jacket are fastened. 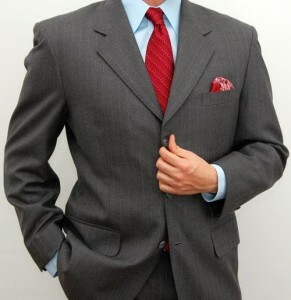 Formal suits may have jetted pockets which are swen nicely into lining of the jacket and only slight opening is visible. But today's most formal suits have flaps and it is perfectly acceptable in all circumstances where a gentle men is expected to wear a suit. While buying a suit, you have to observe two things. Lapels and Vents. 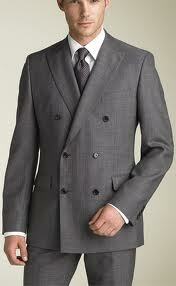 Lapels are the collar cuts. The most common are peaked and notch lapel. Vents are the cuts behind the suit while makes it easy for us to sit and take any item from trouser pockets comfortably. In the diagram only left vent is visible. For those who do horse riding, double vent is most suitable. Otherwise single vent is sufficient. same fabric, Blazers are jackets which comes without trousers. You can wear them for less formal occasions on different colored trouser. Most employers expect their employees to be dressed well in all occasions. Though it is not necessary to wear suit every time, but wearing formal shirts is always important. 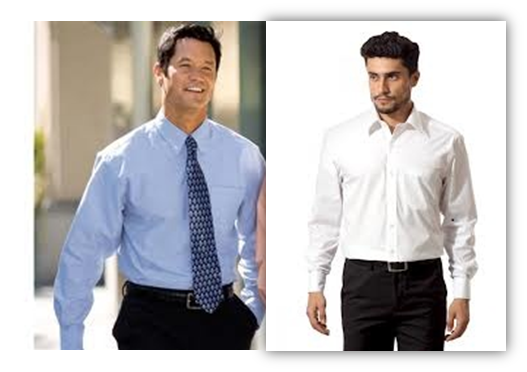 Plain shirts are recommended as formals. Most common colors you can choose in plain shirts are White and Blue. Along with these plain shirts you can also have some stripes and checkers in your wardrobe. Also there are two types are collars to choose from. The collar in the middle diagram is a pointed collar and right one is cut away collar. Cut away collar should be chosen If you are going for a bigger Tie knot. A nice Tie really enhances the dignity of the suit or a formal shirt. Ties are made of silk. You can choose either solids or stripes or printed Ties. But the chosen Tie must be match with your color of shirt. A Tie should be worn such that it just be hanged above your belt buckle. Though A Tie can be knotted a number of ways, Four in hand and Windsor knots are the most important and easy to tie ones. Depends on the knot size and height of the person, A Tie knot should be made. Trouser selection is the most important element in the personal grooming. A wrongly stitched trouser really mitigate the dignity of the person. 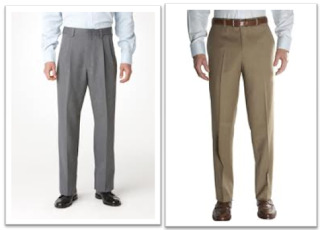 You can choose any of the two types of trousers based on whether it is pleated or plain. Remember, Your trouser length should be perfect that when you bend or sit your socks should not be visible. If trouser length is too long it will be worn out at the back and looks ugly. Usually black shoe is considered formal. You can choose either Pointed Oxford shoe or Brogue shoes. Full shoe always look formal compared to half shoe. Shoe should be shined often. Instead of buying Canvas shoe better to have pure leather shoe as their durability and comfort are more. A sock should match the color of the trouser and white should be avoided. The more formal the occasion the thinner socks should be worn. Always wear properly washed sock pair. There are lot of types of socks available like cotton, wool etc. You can choose any of them based on the season and climate conditions. 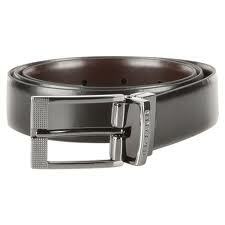 A belt should not be worn to fasten your loose pants. If that is the case it is better not to wear it. A quality belt is sleek and smooth. You can choose a size of 3/4 " or 1" belt. But I always prefer 3/4th inch. 2. A shirt should not too loose. Look at the above diagram of shirts. A properly stiched shirt should give an impression that it is made for you not for any one. 4. Lastly, investing in buying good dresses always pays big dividends.